Based on the riding holiday specialist’s recent winter tour Ranch Rider is now offering a 7-night African Explorer Safari. The itinerary includes a 4-night stay at South Africa’s Camp Davidson and three nights at Botswana’s Tuli Block Camp – visits to both countries arranged without the need for an internal flight. Ranch Rider's journey ended with a five star road trip covering the Drakensburg Mountains and Rorke’s Drift, the chance to discover ancient bushman paintings and tour the Isandlwana battlefield available activities on the new 7-night “Soul of South Africa” self-drive. Situated high up in the bushveld and overlooking the Matlapeng Valley, South Africa’s Camp Davidson is built to resemble an early cattle post. Its four “A” Frame tents offer additional creature comforts including, en suite bathrooms and private verandahs, and there is a newly built pool. Starting out in the heart of the wooded mountains of the Waterberg, twice daily rides or all day rides with a bush lunch are on offer to guests – giraffe, hippo, and zebra residing in the private reserve. Easily combined with a stay at Botswana’s Tuli Block camp, the twin centre holiday is ideal for those who want to ride amongst Africa’s game, and the Big Five. Close to the Limpopo and Majale rivers the Botswana site is home to leopard, elephant and cheetah, and completely unfenced the wildlife viewing goes on back at camp. En suite tented accommodation, private verandahs and a swimming pool make for truly wild glamping. 7-night African Explorer Safari from £1,579pp (two sharing) including tented accommodation, meals, safari activities and taxes. Excludes gratuities, transfers from £275pp and return flight from £839pp. Ride across Namibia on a mobile horseback safari; elephant, rhino, cheetah and plains game inhabiting the desert landscape. Largely inaccessible, Damaraland is home to the largest free-roaming population of rhino in the world, and the forbidding Skeleton Coast is yet another spectacular and unspolit area. 10-nights with Ranch Rider from £2,512pp (two sharing) including, camping accommodation, meals, drinks on safari, activities (all riding) and transfers from Windhoek. Excludes gratuities and return flight from £1,169pp. Departing 18 April. Saddle up at Ant's Nest, a luxury bush home in South Africa's Waterberg region. 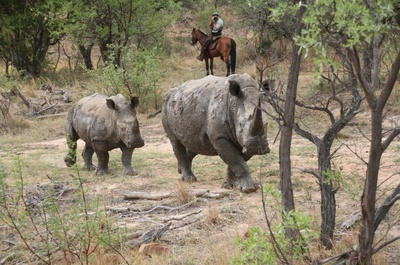 View rhino, giraffe, zebra and more from the back of a horse in this private reserve. Big Five 4X4 drives are also included in the stay. 7-nights with Ranch Rider from £1,295pp (two sharing) including, accommodation, meals, drinks (including alcohol), riding safari’s, 4×4 safari’s, guided walks, use of facilities and taxes. Excludes car hire from £225, gratuities left to discretion and return flight from £889pp. Any day departures from 01 March to 24 March. Perched high up on the Pakamisa Mountain Range in northern KwaZulu-Natal is South Africa's Pakamisa Lodge. The luxury property is home to a collection of magnificent Arabian horses and mixed breed horses, and leopard, giraffe and zebra are often found roaming across the private reserve’s 6,000-acres. Pakamisa's suites overlook the plains of the Pongola River, a maximum of 16 guests enjoying the epicurean delights of the El Prado restaurant and after dinner drinks in Hunter’s Bar. 6-nights with Ranch Rider from £1,008pp (two sharing) including, accommodation, meals, riding safari and game drives, use of facilities and taxes. Excludes car hire from £225 and return flight from £889pp. Departures 01 March to 31 March.